French pilots Olivier Masurel and Aude Lemordant were tussling for the top spot as the aerobatic competition got under way at the Skydive Dubai drop-zone. In a field of eight hand-picked pilots from across the world, it was Masurel and Lemordant – incidentally the only woman in this event – going for top honours in their top of the range aeroplanes (each costing nearly 500,000 Euros) that have been flown in especially for this event. 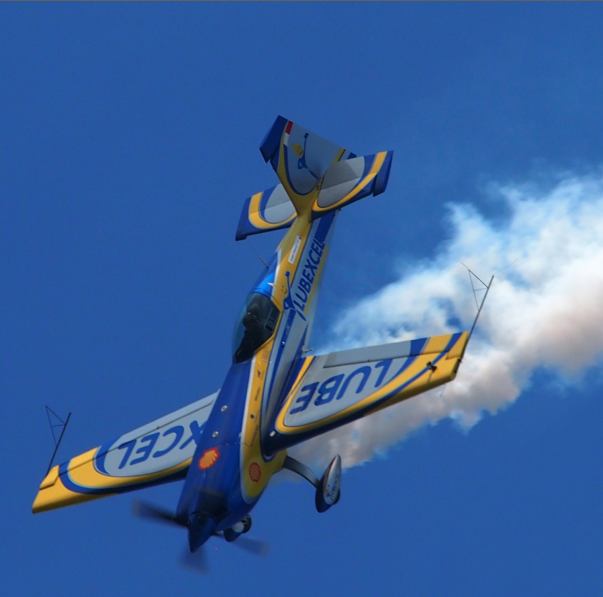 Aerobatics has been performed almost since the first flight of a powered aircraft. In the early years before World War I, aerobatics served as entertainment for crowds fascinated by the new aerial machines. However, later aerobatics became essential in a military pilot’s training that could be utilized during combat situations. Today, aerobatics is seen as among the most important and essential elements in making the pilot more in control of the aircraft. The competition can either be powered or gliders. In aerobatics, the pilots perform rolls and dives that put their bodies through positive forces up to nine times the gravitational force. But while going through the manoeuvres, the negative ‘G-force’ takes all the blood to the brain making it necessary for the participants to manage the plane’s control and stay oriented to do the tricks. Though the Breitling-sponsored Lemordant is the only woman in the field, she can be assured of some tough competition on the final day of the competition from pilots such as Russia’s Mikhail Mamistov – now third overall in the standings – Artur Kielak of Poland and Nigel Hopkins of South Africa. Though the judges will be looking for accuracy and precision during the final heat, the other pilots in the field stand a better chance as the scoring encourages flamboyant flying. Meanwhile the para-glider competition got under way at the beach drop-zone and it ended in a slight heartbreak for reigning world champion Matiaz Feraric of Slovenia as he struggled to judge the conditions and landed 28 cms away from the target. For this competition, pilots are towed up into the sky over the beach with a winch. They are required to wear a stud on their shoe that helps detect the electronic landing mat. Unlike accuracy parachuting, para-glider pilots have their wings giving them greater control, and must land on their feet to make their scores count. All participants need to make a mandatory 12 jumps, and at the end they are allowed to discard one score before the final top three finishers are announced. Meanwhile, the First UAE International Symposium on Air Sport Medicine will take place at the Meydan Hotel from Friday morning. A part of the 2015 FAI World Air Games and done in coordination with the FAI Medical Commission, the symposium will seek to have a fruitful exchange of knowledge and expertise between medical personnel involved in aviation medicine with specific focus on medicine in extreme situations in air sports and in other fields of aviation.